Recently we reported about the hands-on live images of Nokia 9 which revealed the back panel of the smartphone with a five camera (here). 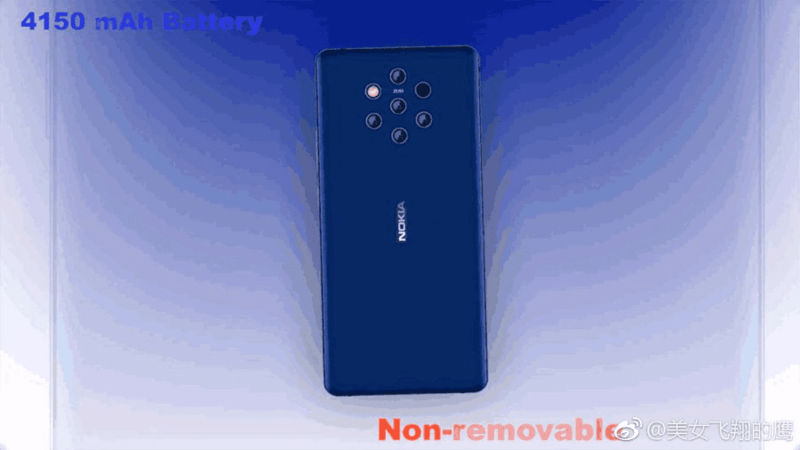 Now today a fresh render image of the alleged Nokia 9 has been spotted on the Chinese social media platform, revealing its rear design and hints at the battery capacity of the device. From the image alleged Nokia 9 seems to include a huge hexagonal camera layout with e ZEISS certified penta-lens setup accompanied by LED flash. The back panel of the smartphone lacks a fingerprint reader, thus it is speculated that the device will be equipped with an in-display fingerprint scanner. The image also reveals that the handset will pack a huge 4,150mAh battery. However there is no information regarding its front panel, hence, it still remains a mystery whether the Nokia 9 features a notched display design or a notch-less tall screen. Recall early there were reports that the Nokia 9 will feature a 5.9-inch OLED display with Quad HD resolution. It would be powered by Snapdragon 845 chipset and may run on Android 9 Pie OS. Recently Nokia 9 variants has spotted on Samsung Latvia website which revealed that the Nokia 9 would be available in 64 GB and 128 GB internal storage with single-SIM and dual-SIM versions, probably, these could be the variants that will be available in the Latvian market.